Hello. Welcome to my website. My identity does not really matter, so please just call me Crouching Tiger, a generic term that symbolizes the reasonably coordinated and average golfer. Like millions of golfers, I too was smitten by the charms of the game. It was love at first swing. And like a million golfers, I too bought a copy of the best-selling golf instruction book - Ben Hogan's Five Lessons: The Modern Fundamentals of Golf . I read it diligently from cover to cover. It is a thin little book with vivid images created by the renowned sports illustrator Anthony Ravielli. Thus armed, I began to haunt the practice with the zeal of the new disciple. It took me a couple of years before the realization dawned on me: I could not swing like Mr. Hogan. The instruction in Five Lessons could not make me swing like Mr. Hogan. I looked around and found myself in august company. Nobody else has been able to swing like Ben Hogan either. In despair I turned to other avenues, other swing methodologies. During the course of this process, I hit 5,000 golf balls a month for five straight years. Each time I discovered a new way to hit a golf ball, I compared it to the Master's technique and said: " This is not the way Mr. Hogan hit the ball". Deep inside, without my being conscious of it, I had become a seeker of the Holy Grail of Golf. Such was the mesmerizing effect of the Master's fluid and powerful motion.The quest became an obsession with me. I researched everything I could find about the Master. 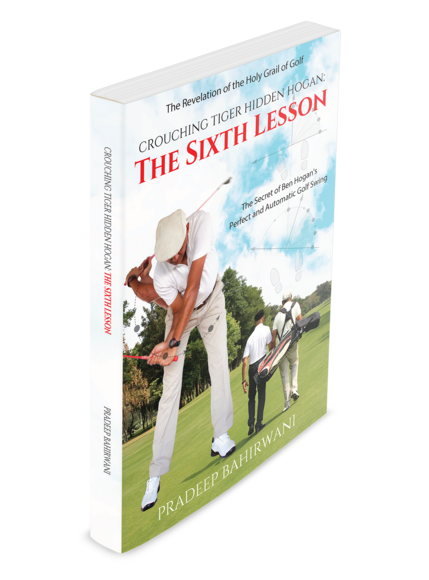 As I gained insights into the life, times and the mind of the Master, I discovered the reason why Five Lessons could not help me duplicate his swing. It is called Hogan's Secret. where A , B, C and D are integers and X is a measurement with both magnitude and units. AX and BX are setup attributes. CX and DX are movement attributes. Do not be dissuaded by this string of numbers - the Hogan Code is simple and symmetrical in concept and like clockwork in execution. You will find four necessary and sufficient clues in this website. Go ahead right now, open your copy of Five Lessons and try and discover the Hogan Code. 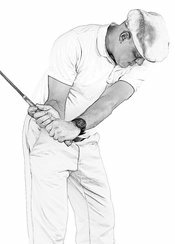 If you are an exceptional and brilliant golfer like Ben Hogan, the odds are that you will be able to crack it and make an integral picture out of it. But if you are a Crouching Tiger like me, then you too will need to discover the underlying Secret before you can do so. It's out! The book that lays bare Hogan's Secret! AX : The first clue to the Hogan Code is on page 42. You will need to put two and two together and add the rest of the detail.